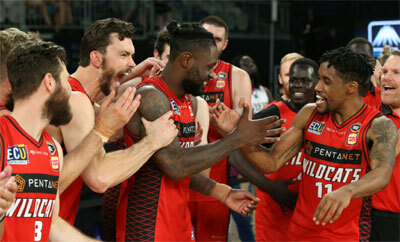 The Perth Wildcats are again the toast of the NBL winning their ninth championship on Sunday in front of 10,007 fans at Melbourne Arena. The Wildcats have won their record-extending ninth NBL championship but have clinched it on the road for the first time in 29 years beating Melbourne 97-82 in Game 4 making the statement on the road. The Grand Final Series began with strong home victories for both teams in the opening two games, but it was quite the statement Perth made on Friday night at RAC Arena winning 96-67. It was always going to be a significant job for Melbourne to respond to that and force a Game 5 even with the comforts of home. The Wildcats were just feeling too good about themselves with their defence too stifling and offence fluent enough to win Game 4 by 15 points and secure their ninth championship. It is a fifth title for the Wildcats in the past decade and for the first time since 1990 when they won their maiden championship in Brisbane, they have celebrated their triumph in an opposition venue. Their past seven titles were either secured at Perth Entertainment Centre, Challenge Stadium or RAC Arena. Bryce Cotton (185-G-92, college: Providence, agency: Pensack Sports) had been a master distributor so far this Finals series but stepped up for a game-high 28 points on Sunday while Terrico White (196-G-90, college: Mississippi) had another 20 points, eight rebounds and three assists to secure the Larry Sengstock Medal as the Grand Final MVP. Cotton showed he is still the best import in the NBL with 18 of his 28 points in the first half while White capped off a brilliant Finals series despite battling foul trouble in the first half. Casper Ware (178-PG-90, college: Long Beach St.) led Melbourne United with 18 points while Chris Goulding (192-G-88) and David Barlow (205-F-83, college: MSU Denver) had 15 points each. Melbourne had first points through Barlow who set a new record for NBL Grand Final appearances in his 26th game but Perth launched a 13-0 run to take the lead behind White and Cotton. But Melbourne rode the energy of Mitch McCarron's shot-blocking and the scoring of Barlow, Ware and Goulding to a 28-26 lead at quarter-time with Goulding's late four-play a highlight. Foul trouble had Perth nervous as White and captain Damian Martin (186-G-84, college: Loyola Mary) both picked up three fouls but it mattered not as Cotton took charge of the second term in the most resounding of fashion. Cotton couldn't be stopped as he reeled off baskets and assists to have Perth in front by double-figures with Mitch Norton (184-G-93)'s three-pointer putting Perth up 12 late in the term before Goulding and Ware's layups cut the lead to 53-45 at half-time. Cotton had 18 points and four assists at the main break. The Wildcats made their move in the third term, just as they had all series, and had a 68-57 lead at three quarter-time before making sure of the title in the final term. The championship triumph means that Martin and Jesse Wagstaff have shared in all five titles this decade to become the only players in NBL to do with five championships at the one club. Greg Hire bows out a four-time championship winner while it was a third title for Tom Jervis (211-C-87, college: Troy), and a second for Cotton, Angus Brandt (208-C-89, college: Oregon St.) and Rhys Vague (204-F-96).